Hello—recently purchased a new style 10x15 C&P which had been removed about 10 years ago from its original location in a funeral parlor basement in Detroit. The press was disassembled in order to be taken up a flight of stairs and then sat in a barn for several years. The press seems to be 100% complete condition except for the treadle and a couple of bolts. Everything seems to work fine and I have reassembled a couple of pieces which were left off the press. The main thing I have reassembled is the throw off mechanism and it now operates quite smoothly. We ran the press by hand and with the motor prior to reassembling the throw out and everything ran smoothly, however, now that we have everything together, the press snaps shut with a loud bang when under power. We are operating the press with the flywheel spinning away from the operator or counter-clockwise when looking at the flywheel side of the press. Any thoughts on what could be causing this banging? Thanks in advance! Maybe the press got wind of your press name and is trying to blast your eardrums! But really, Can you locate the source of the noise? Is there anything binding when the press closes? What is the timing of the noise? Is it when the Rocker Lock (x-braced framework in the front of the press) snaps into place? Doing a little detective work might help troubleshoot the noise. One place that might be worth checking is whether the bed rails make contact with the platen. Perhaps something is out of alignment? I’m thinking out loud here, but it might make sense, as operating the throw off moves the platen closer to the bed. I spent awhile staring at my 10x15 debating whether this would even be possible, but it’s easy to check. You could also slowly move the throw off to intermediate positions while the press is moving - to see if the sound is dependent on the position of the throw off lever. I second the questions about the rocker lock. On my press, this makes a clicking noise every cycle (although it is by no means a loud bang). Yes, we have listened for the sound and it does seem to be occurring when the rocker lock is engaging. One thing I have noted is that the rocker lock does not seem to fully engaging when the press closes. The top mating surface of the rocker lock is closing about half-way—I can provide pictures tomorrow. It appears that the roller on the left-hand cam that operates the mechanism doesn’t return to the full depth. Judging by the marks on the rocker lock, it would seem this has been the case for some time. While the rocker lock may not be closing completely, it still doesn’t seem to explain the loud snap when the press closes. It is definitely not supposed to be hitting that hard. Bed rails are definitely not making contact—we have run an impression, and apart from some platen adjustments, it appears to be in working order. Could the platen be adjusted to close? I can’t say I have tried running the press with the throw out in all positions, simply because I am afraid of damaging the press. No apparent problems when hand rotating the fly wheel. Could there be an issue with the rocker lock? Thanks for the feedback! It is possible to install the throw off linkage improperly. Especially the saddle that attaches to the rear main shaft of the press. Take some photos and maybe even a video and post the link. I’m pretty sure I follow you on Instagram so perhaps post photos/video there as well. Also… I’ve never seen a rocker lock that engages fully (and I’ve seen many). I believe they were designed to only engage 1/2 - 2/3 of the way. So that’s probably not the issue. My guess would be either in a cam/follower or perhaps in the throw off linkage. Post some photos/video tomorrow and we’ll get it sorted out. You have just about solved your problem. In your initial post you said that the press ran smoothly under power and when spun by hand. The problem developed when you reassembled the throw off mechanism. That tells you a lot and tells you where to focus your further efforts. Disconnect the vertical link in the mechanism. The part that attaches to the saddle in the back under the ink disk. Spin the press by hand. What do you observe and hear. If the sound has gone away, you know where the problem is. It is in the throw off mechanism. There is one other possibility, but please do check as I said in the previous post. Any time you hear a noise that doesn’t sound right, you must locate the source of the noise. If you do not have a mechanic’s stethoscope, you can improvise with a long screwdriver. Have an assistant turn the press by hand. Stick handle of screwdriver in your ear and tip to the suspected source of the sound. Even with hand turning, use great care. Perhaps even as simple as a WORN key somewhere/anywhere in the drive train, i.e. where the tiny pinion gear meets the large cog/pinion, by default that key always takes a beating, consequently on the over-run inertia and gravity allow the Platen to *Clunk* 1/8” possibly more,? from as little as .002” (2 thou) wear in any key/keyway. With safety paramount and 2 pairs of hands, m/c. turned by hand, sensative fingertips will FEEL exactly the precise point in the cycle where any problem occurs.! Aerosol propelled *Motorcycle Chain Grease*applicator with the usual extension tube (plastic) sprayed into/on every gear/pinion meshing point, slowly and progressively, will often establish which part has the most wear, proving where and rectifying may not always be compatible. Apologies if the above is rubbish, but may prompt further investigation(s). Thanks everyone for the feedback. I will get some images up in a bit. Is the noise present when you run the press by hand? Or only if operating via the motor? My thoughts were running in the same vein as Mick. How is the motor attached to the press? You mention that the noise is only made when the motor is running. Is there perhaps a loose connection? This would make more sense if the motor is connected separately on the right side of the press rather than driving the flywheel directly. Thanks Brad, inky, Mick and mgurzo. The motor is belt driven off the original subframe on the rear of the press. So, after studying several diagrams, the throw out is definitely assembled correctly. Upon closer inspection, I noticed exactly when the noise occurred and examined the large gear cam. Unless I am mistaken, we have a missing cam roller. As you can see in the attached image, what is turning in the cam channel is just a metal post. This could definitely explain the fact that the press is slamming shut, over closing, or otherwise running out of its usual track. It also explains why the noise only occurs when the press is under power, as it is only with the motor that the press reaches a high enough speed to throw the roller-less cam agains the far side of the cam channel. Just hoping that the post hasn’t scored or otherwise damaged the cam surfaces. Does this make sense? Thanks again! Just checked it again while manually turning the press over and you can see where the roller-less post jumps off one side of the cam channel and touches down again. I would put money on this being the cause of the slam, although the contact seems to be coming from another part of the press—rocker lock or platen itself. There does not appear to be any damage to the cam channel surfaces. Yep. You’re missing the roller. That would explain the sudden and loud movement of the platen as it rocks closed. I’m not near my 10x15 NS but I could get measurements of the roller in the next few days. It should be a fairly simple procedure of lifting the platen and rocker off of the press and fitting the roller to the stud. Let me know if you want measurements. I wasn’t sure if the best way of getting at the cam was to remove the large gear, or to go at it the other way round with the platen and rocker as you say. Contacted the seller to see if they might still have the roller and have one ready from Dave Churchman if it cannot be found. I will post updates as I figure it out. Congratulations on your troubleshooting and careful visual inspection. When you get the cam roller replaced, do not forget to oil the roller and cam surface regularly. That is a bit of a difficult place to get to and easy to forget. When cleaned out and the new roller is installed, both the roller and cam should be bright bare metal. If correctly lubricated (oil) they will remain that way. 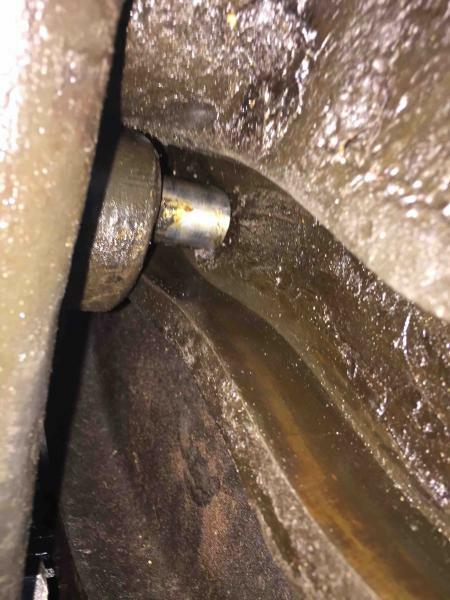 can you get the cam roller stud out through the hole in the main gear? To install the roller… cycle the press so the stud and the hole in the side of big gear cam wheel are aligned. Remove nut from stud. Tap stud out through hole in wheel(inside to outside) Hold the press in this position. Put cam roller in camway. Hold it in alignment with hole then replace stud and tap it in place (should be snug fit). Replace nut. Cycle press by hand to check everything. Make sure to let us know it’s up and running when you have the repair complete! you may not be able to “tap it out”. but a pry bar in there should be able to push it out. if it really in there tight, tapping in a large chisel should get you going. may have to loosen nut, push out. loosen nut, push out, loosen nut, push out. it can be tight in there.just opposite for install. make sure you “run the roller” all the way around the groove, in the main gear carefully. you will have to turn the gear to do this. just be careful. make sure it passes freely all the way around. investigate any tight spots. seeing as how the rocker has been banging in there, i would check very carefully to make sure that once tightened the stud does does not wobble. if the stud is the really new style, it is “peened over” in the rocker arm. if you know you are doing you can wiggle the rocker out. in your case, getting out will be easy. it will be getting it back in that will need your most attention. easiest way is to knock the “head cam” off on the operator side, put the roller on, and install head cam. i use a single burner hot plate to heat the head cam, it expands and with some hot gloves, welder style, it slides right on. find position quickly with the key. heating the head cam with an acetylene torch, rosebud tip, will help a lot in removal. not ev one has this torch. try to find someone with one to come over and help. i use a brass block, (held in place by helper, with a big pliers,) and bang the head cam off with an appropriate size hammer. might need all the way up to sledge sized, then again, it may just slide right off at some point. Thanks for the comments everyone. Now that I know what I’m looking at I can’t believe I missed the fact that the platen can rock a good 2 inches or more… In this case the previous owner reassembled the press without installing the roller. The stud is in place, but without the roller. Luckily, I don’t think any damage has been done, although I will check again for scoring or damage of the camway and roller stud. Sounds like that access hole in the main gear can make this a whole lot easier than on older models. I plan, as ericm and skiyoui recommend, to remove the nut and pry or tap the stud out through the access hole, then do a test fit of the roller and stud off the press before placing the roller in the camway and tapping the stud back through the access hole. I take it there is no need for a fastener on the outside of the stud? just the nut on the back? mgurzo, just found your thread on a similar issue: http://www.briarpress.org/41226. Also a bit of info in the response to this thread: http://www.briarpress.org/17531. ericm, I am hoping to not need to remove the head cam to reinstall. I take it that the reason for needing to do this is that it is difficult to align the stud with its mounting hole? 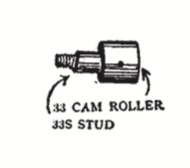 I’m not sure I follow you with regard to the “peened over” stud—is this a measure to secure the outside of the roller? Could this necessitate removing the cam head? I should mention that according to the serial number this new style press was built in late 1919. I am surprised no one has commented about the grease. From my reading of instructions found in C&P literature, the inside of large gear is to be oiled only. If the cam roller is oiled frequently, it spreads inside the track. Of course all that grease probably protected it inside of the gear channel from excessive wear. What about the grease Briar readers? Foothill press, not sure about the grease. It does appear to be grease, but might be just decades of accumulated dirt, ink and oil. The press would barely turn over when we got it—it was amazing to see how quickly it responded to engine oil. I got all but the crankshaft bearings (which I didn’t see at first) and it would do about 2-1/2 turns on its own. The second turn after oiling the crankshaft you could feel it free up and turn easily 4 turns. We are having difficulties removing the stud. Is it possible that it is fully threaded? Are there any other secrets to getting this thing to budge? NOT threaded all the way, your own schematic drawing shows the construction,unless the threaded portion had a screwdriver slot you could not unscrew anyway.! For many years we have performed this operation, (when all else has failed) i.e. using Quoins as >>PUSHERS<< rather than Pullers or Extractors. One actual example, the main Driven Pinion on a Thompson British Auto Platen (as big as a dinner plate) could, generally NOT be pulled with multi legged pullers, because the Legs would rip the teeth on the pinion, hence 2/3/4 Quoins at equidistant points behind the pinion as pushers.?? YES we have sacrificed a few, (in a production house stocking hundreds) Not an option for smaller units.!! Hemple Wedge style Quoins also work well, but may need modified Key with extension.? Apologies, if the ramblings do not translate, or are impractical. The general rule I learned as a young mechanic was: grease on gears, oil on bushings and bearings. I also learned that NO grease was to be used on a platen press. Liberal use of oil. If there is no oil on the floor, you are probably not oiling enough. Thank you Mick and inky, we finally got it. It was a doozy and I (amy) have a wimpy tap. It definitely took a little shimmying to get the cam on the shaft with the proper alignment. Our C&P is running much smoother thanks to all your help. Oil only on the press. I would check the oil holes on the rollerto be clean and open. 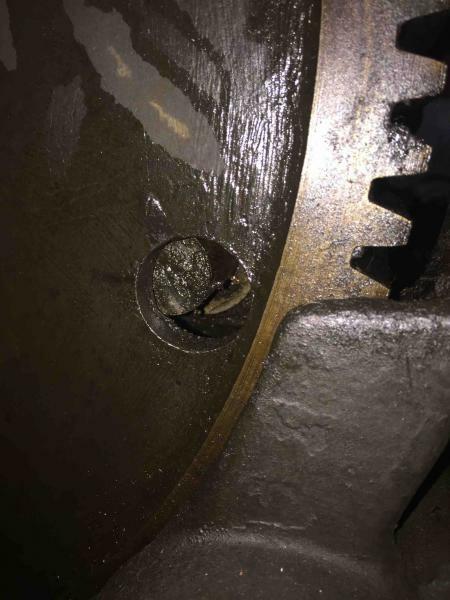 No reason to pull the cam wheel on this repair. If you pull the big or little cam wheel off then you are faced with the task of pulling/pressing it back on….very difficult to do….especially on a 12x. Yep, one of the few times in my experience where “just hit it harder” actually worked. Finally managed to tap the stud out with a long bar from the far side of the press and a medium sledge hammer. Cleaned and oiled the camway, and checked the condition of the stud and roller. Getting everything lined up properly to tap it back in to place took all of three people, but it all went back together perfectly. The press now runs perfectly and has no play in the platen. In the process I did notice that there is a bit of side-to-side play in the main crank shaft, but am guessing that tapping in the woodruff key on the smaller drive gear a bit more should solve this? Thanks very much for the very helpful feedback on all of this. Can’t wait to start running some jobs on this press.